Canta en Español 1, published by La Jolie Ronde, is an audio CD containing 37 tracks of songs and poems to support Spanish language learning. It is aimed at ages 4 - 11. It comes with a full transcript and English translations are included. 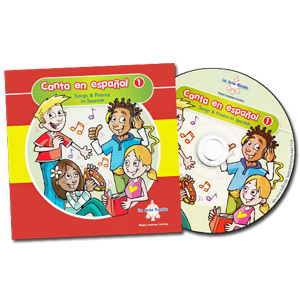 The songs on this CD are original songs written especially for Spanish beginners. Canta en Español 1 is aimed at Spanish beginners. It is recommended for ages 4 - 11 (Early Years, Key Stage 1 and Key Stage 2). It is published in the UK and uses European (Castilian) Spanish. This CD is really great, I have the same one in French and I love that most of the songs are the same, just translated! The melodies are catchy and the lyrics have been pretty easy to learn. I love that it includes themes like days, counting, months, etc. A really handy resource! I had high hopes for a Jolie Ronde product. The songs are neither catchy nor helpful in teaching unfortunately. The children absolutely love the songs and we are going to sing two of them at our end of year service. Catchy tunes and relevant lyrics, which the children have been able to use in conversation during the lessons and around school. WE DON´T LIKE IT AT ALL...THE TUNES AND SONGS ARE TERRIBLE AND IT WAS A WASTE OF MONEY BUYING THIS PRODUCT. I was very impressed with both the service and the products. The prices are also very reasonable. I would definitely recommend the Little Linguist site to anyone who is looking for good quality primary language teaching materials. I will also be using your site again soon. My 8 year old has been studying Spanish for over a year now and probably found this CD a little basic but enjoyed it none the less as she knew all the words! Would be excellent for beginners.